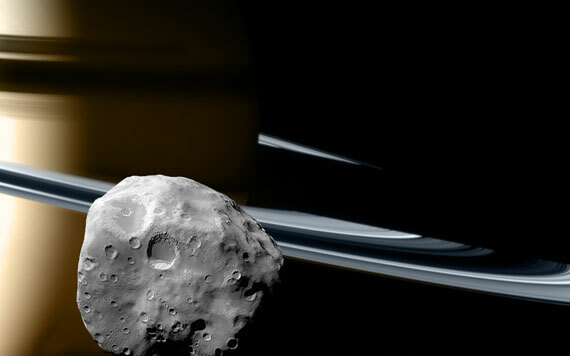 Janus and Epimetheus are inner satellites of Saturn. They share the same orbit of 151,472 kilometers from Saturn’s center or 91,000 kilometers above the cloud tops. They are only separated by about 50 kilometers. As these two satellites approach each other they exchange a little momentum and trade orbits; the inner satellite becomes the outer and the outer moves to the inner position. This exchange happens about once every four years. This behavior is unique in our entire solar system. Janus and Epimetheus may have formed from a disruption of a single parent to form co-orbital satellites. If this is the case, the disruption must have happened early in the history of the satellite system. 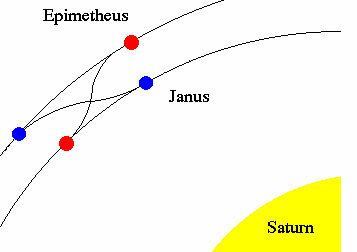 Epimetheus and Janus travel in orbits separated by only 50 km and exchange places every four years. Meanwhile, Epimetheus speeds up, orbital period goes down, radius decreases. 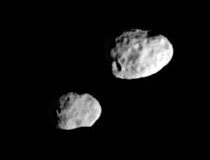 See a video of Janus and Epimetheus in their orbital dance here and here. ONCE there was a boy who listened to an old man. And, thus, began to learn about The Precious Present. This is a scene from Lost. The episode is called “The Moth”.